This an exciting time to be engaged with libraries as we are entering into a renaissance period. We are finding even more ways to connect with our patrons in unique and meaningful ways. IMLS plays an important part in helping the Colorado State Library (CSL) in supporting libraries around our great state. Funding that comes through LSTA allows CSL to provide innovative services, important resources, and relevant training and support for all of our public, school, special, and academic libraries. The end goal is stronger, more connected citizens and communities throughout Colorado and libraries enable that to happen. The Colorado State Library funded the creation of six StoryBlocks videos in partnership with Colorado Libraries for Early Literacy and Rocky Mountain PBS. 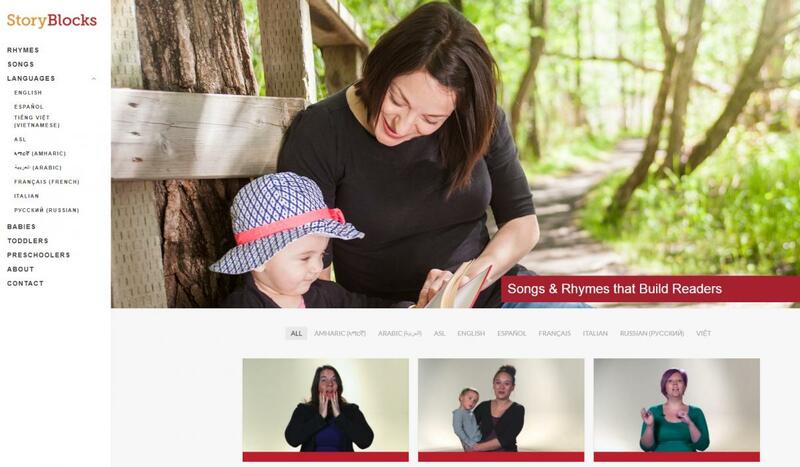 These 30-60 second videos showcase librarians demonstrating rhymes and songs appropriate for children ages birth to six. The videos also include an early literacy tip to explain why the activity is beneficial for language and literacy development. Videos in English, Spanish, Vietnamese, and Amharic are available on the StoryBlocks website. IMLS also funded the SPELL (Supporting Parents in Early Literacy through Libraries) initiative. In this program, state library staff field-tested and evaluated practices for public library staff to reach low-income parents with early literacy messaging and activities. The grant included the purchase and distribution of Collaborative Summer Reading Program manuals and training on how to use them. Library Jobline connects job seekers with employers and opportunities in libraries. Established in 2007, Jobline currently has more than 5,000 job listings (current and archived), 1,200 employers, and 4,900 job seekers. 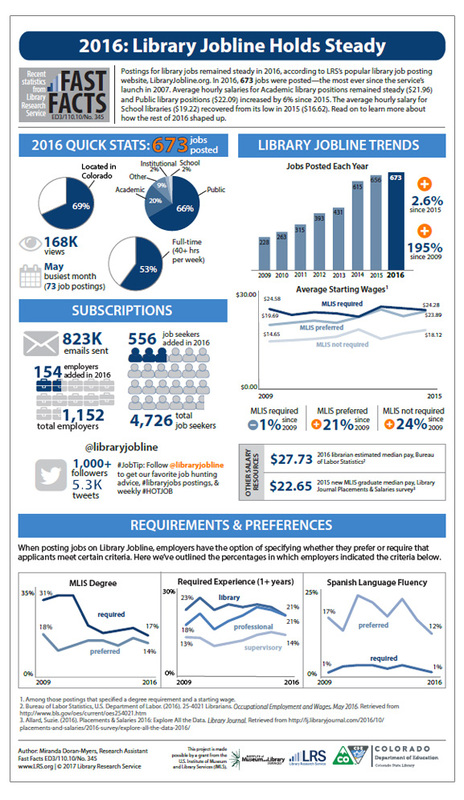 Library Jobline is also a valuable source of workforce data. Statistics and trends are reported annually in a Fast Facts Report and are shared with the field via the LIBNET discussion list and LRS.org. Colorado State Library and Colorado Parks & Wildlife (CPW) partnered to procure and distribute two nature backpacks and state park passes to each public, military, and academic library in the state. The backpacks were circulated to library patrons for one week check out periods. The project began with a pilot program in eight public libraries. Due to the success of the program, it was expanded statewide to nearly 300 libraries. LSTA funding paid for the resources in the backpacks as well as staff to coordinate the procurement, distribution, and evaluation of the project. Local and state press coverage was excellent. The social media campaign reached more than 100,000 people, and the CPW website received 7,500 unique views. View the IMLS funding by state report - Colorado (PDF) with additional information about all IMLS funding for this state (FY 2011 – FY 2016). Goal 1: All Colorado residents will have access to library services that support formal educational achievement and inspire lifelong learning. Colorado State Publications Library: This program gives Colorado residents access to government documents and provides transparency into the workings of state government. Early literacy programming: This program helps impart essential early literacy skills to young children, model techniques to parents and caregivers and provide welcoming, learning spaces for young children and their families. Colorado Family Literacy Programs: This program provides literacy and learning (summer learning, etc.) resources and training to library staff. Library staff will offer engaging learning experiences in libraries throughout Colorado. Career Online High School: This program helps residents ages 19+ who did not finish high school obtain a career-focused diploma and a path toward finding work. Goal 2: Colorado libraries will share resources, expertise, and systems statewide to ensure the efficient and effective delivery of library services to their diverse communities. Resource Sharing Services: Through statewide, interlibrary sharing programs, Colorado libraries will expand the services and resources available to their communities. Statewide Digital Collections: This program expands access to collections housed in Colorado’s cultural heritage institutions and provides richer resources for researchers and students. Technology and Web Services: Provides web-based services and support, helping libraries and cultural heritage institutions communicate with their communities and each other. Goal 3: Colorado library staff and leadership will continuously enhance their skills, advancing library services to Colorado residents. Digital Literacy Instruction: Colorado teacher librarians and other K-12 educators develop instructional skills to teach digital literacy. Highly Effective School Library Program: Help school leaders, library educators and staff continuously improve their educational offerings through the school library program. Public Library as Community Hub: This program encourages local librarians to become civic leaders, facilitate civil discourse, and position public libraries as community hubs. Public Library Leadership Development, Public Staff Learning and Development, Colorado Library Learning for Effectiveness and Institutional Library Staff Development programs: Professional development and training courses will equip public library staff and leadership with he skills and resources they need. Library Data Utilization Project: This project helps library staff learn how to better collect, analyze, report, and use library data. Library Jobline: This job listing service allows both employers and job seekers to create individualized accounts to suit their job hunting needs. Goal 4: Underserved Colorado residents will receive services from Colorado libraries that meet their individual needs. Institutional Library Program Development: This program helps library staff develop programming for institutional residents. Colorado Talking Book Library (CTBL): This program provides free library services to print disabled residents of Colorado. Resource Kits for Libraries: Provide circulating educational kits that help library staff when working with underserved populations. These populations could include, but are not limited to: LGBTQ, homeless, English as a second language speakers, refugees, incarcerated individuals, newly-released individuals.